HDMI is a connectivity standard for video cables commonly used for consumer display devices. HDMI 1.4 supports a pixel packed stereo format - where left and right eye image pairs are sent in a single frame. How to I connect a HDMI display to my Quadro GPU? Quadro GPUs do not feature a native HDMI port. However you can connect to a HDMI display using either a DVI to HDMI cable/adaptor or a Display Port to HDMI dongle. · Are there any special needs for DVI cable/adaptor? No. DVI and HDMI are pin compatible. So it is possible to run HDMI signaling over single link DVI cables. Even though the DVI cable is single link in this mode you get the full HDMI 1.4 bandwidth. · Are there any special needs for DP to HDMI dongle? We recommend you use a DP "Type 2" dongle when connecting to a stereo HDMI display. 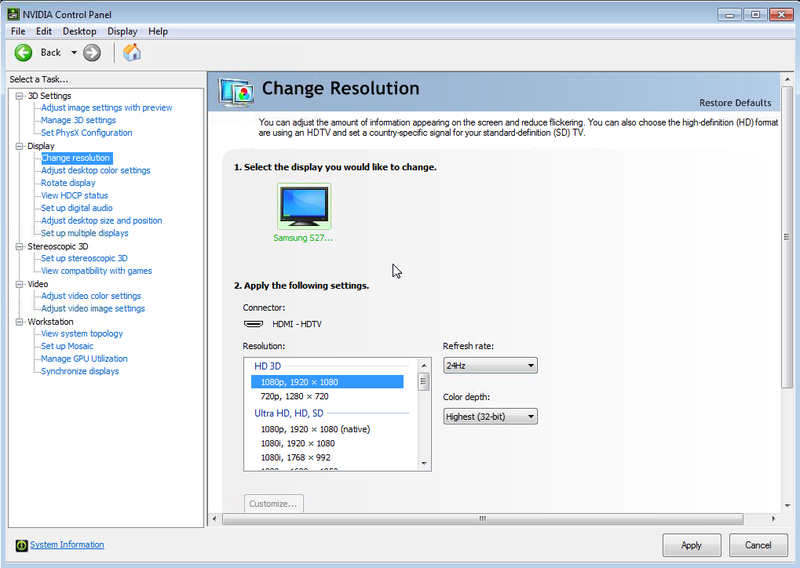 Steps to enable HDMI stereo on Quadro GPU. 2. 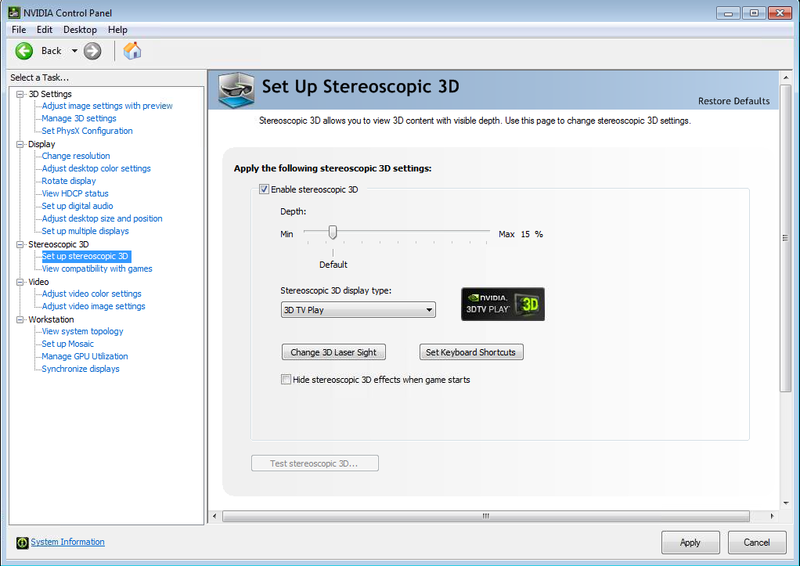 Go to "Stereoscopic 3D" - Select "Enable stereoscopic 3D" see figure 2. Set Stereoscopic 3D display type to "3D TV Play". 3 3. 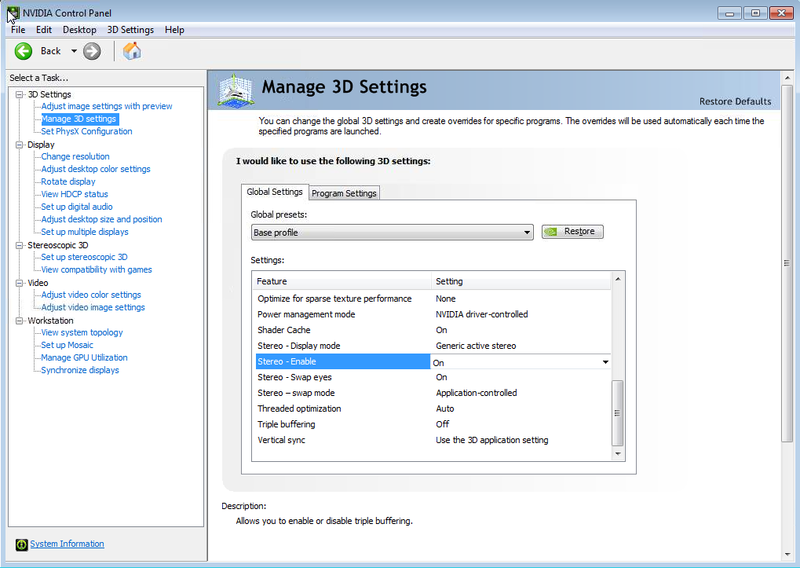 Go to Change Resolution - select a 3D resolution under "HD 3D" - see figure 3.
o Make sure the 3D display is the primary monitor. o No - on Quadro 3D TV Play is included with the driver. o HDMI standard supports input refresh rate of 24Hz or 30Hz. The display device will process the incoming frames and display at 120Hz. o This is a feature of the display. Most 4K displays support 4K or stereo - not stereo at 4K resolution.